PEOPLE in Downend are being urged to go Purple4Polio. 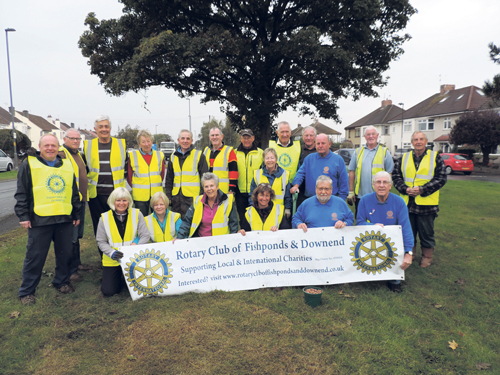 Fishponds & Downend Rotary Club is backing the nationwide Rotary initiative to help rid the world of polio, a crippling and deadly disease. As part of the campaign, members have been planting purple crocuses with Downend & Bromley Heath in Bloom. Purple was chosen as it represents the colour of the dye which is placed on the little finger of a child on mass immunisation days, when millions of children in entire countries are protected against the disease. Since Rotary’s campaign to end polio started in 1985, over 2.5 billion children have received vaccinations, the amount of polio-endemic countries has dropped from 125 to three, and only 18 cases of polio have been recorded this year. For more information visit www.rotarygbi.org and see the Purple4Polio information.